The English often find the Welsh language bewildering, with an ‘alphabet soup’ approach to spelling, but in reality, Welsh is fairly simple, with rules and sounds that don’t keep changing as in English. (If you want real confusion, try Scottish Gaelic, where none of the rules seem to hang around for long!) I’m still not good enough to hold a conversation in Welsh, but my vocabulary of place names and hill terms is still growing. 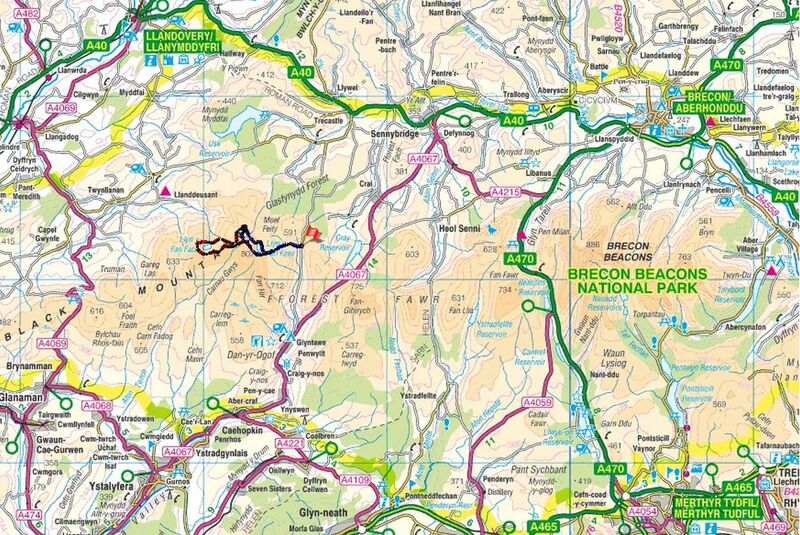 One nice bit of confusion that is likely to trip up the English visitor though, is in the Brecon Beacons, where you will find the Black Mountains (Y Mynyddoedd Duon) and the Black Mountain (Mynydd Du). 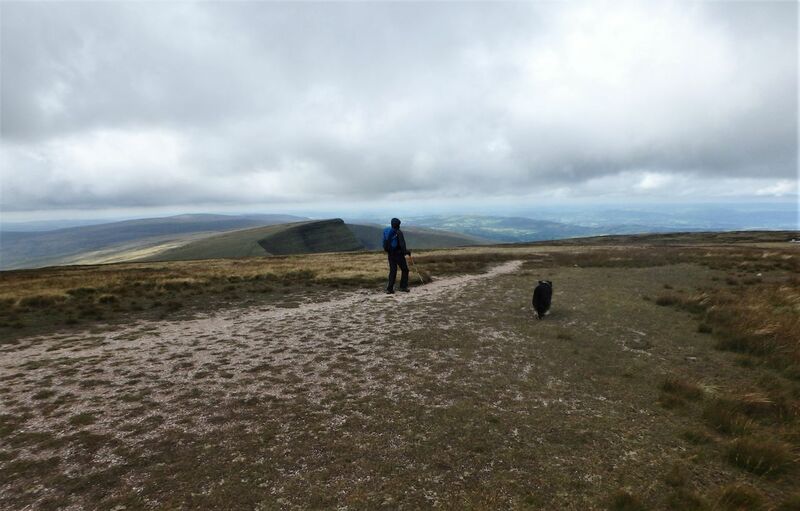 To remove all confusion, the group of hills to the east of the Brecon Beacons are the Black Mountains. 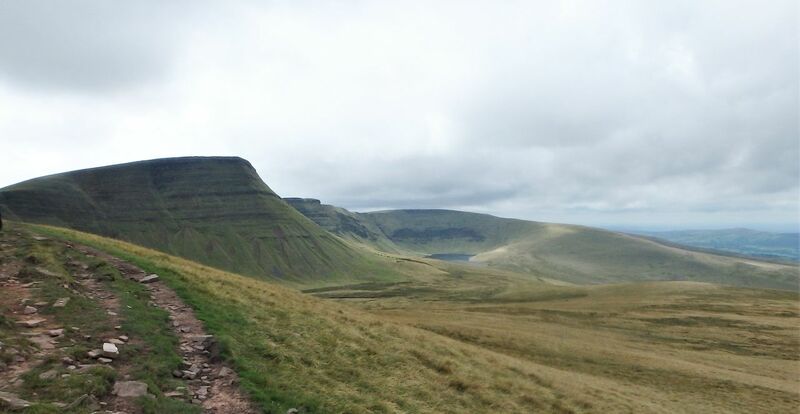 In the centre is what most people would regard as THE Brecon Beacons, with Pen y Fan as the star of the show. 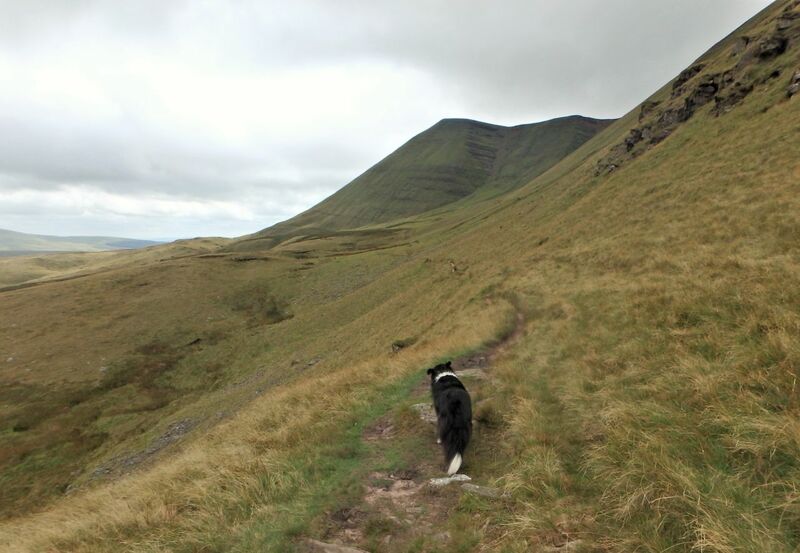 To the west is the Black Mountain, which is where Chris and I (plus Border Collie ‘Mist’) were heading last August. 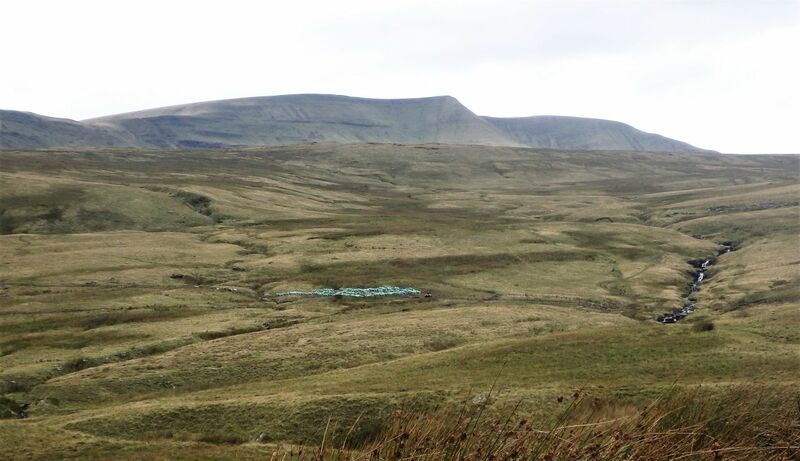 We have been here before in May 2015 (see post #174) but on a different route which had traced the long ridge of Fan Hir after setting out from Dan yr Ogof. 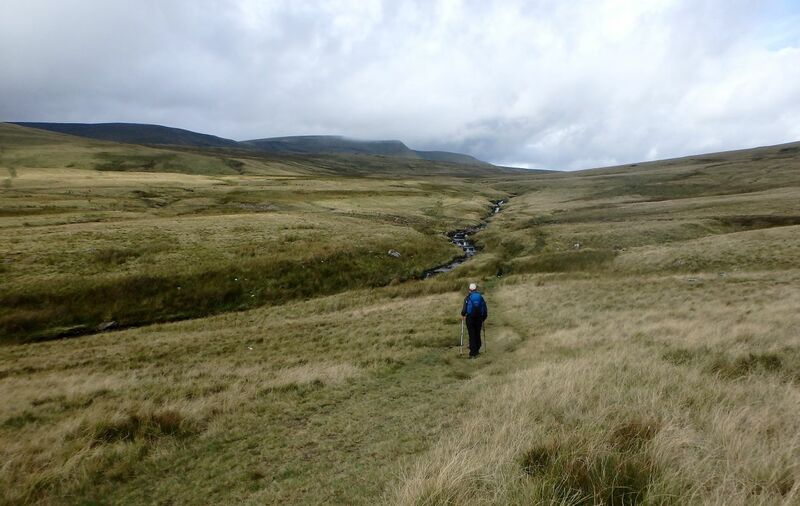 This time we were coming in from the east to explore more of the northern end of these hills – well, that was the intention, but as regular readers will know, things don’t always work out as you expect. 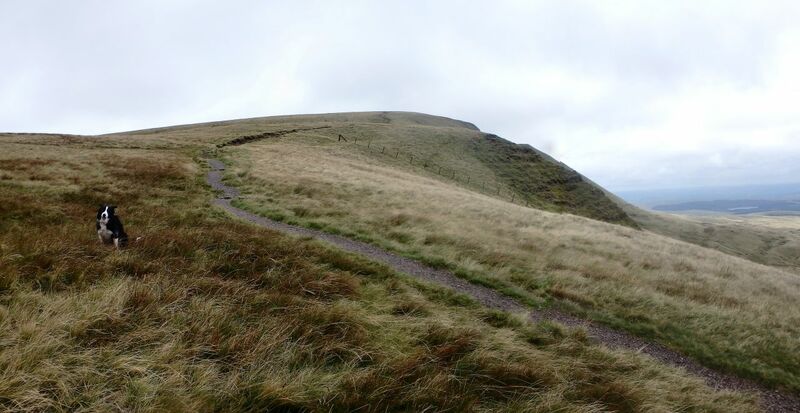 The start of the ascent up to Fan Brycheiniog …. 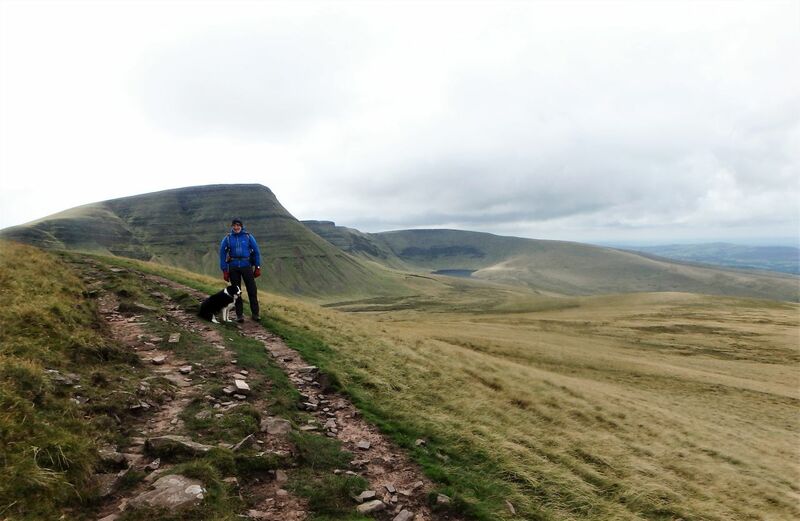 We started out from a minor road running to the east side of Fan Hir – although it was August, it was a good bit cooler than it had been in May 2015. Not only was it cooler, the ground underfoot was on the boggy end of the scale, and we had none of the spectacular views of our earlier visit. 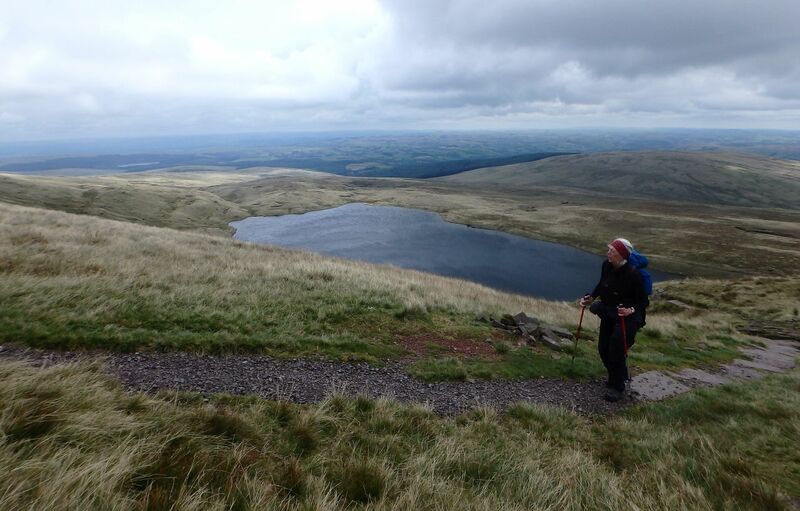 First objective was the lake of Llyn y Fan Fawr, where an ascending path would take us to the col of Bwlch Geidd between Fan Hir and Fan Brycheiniog. 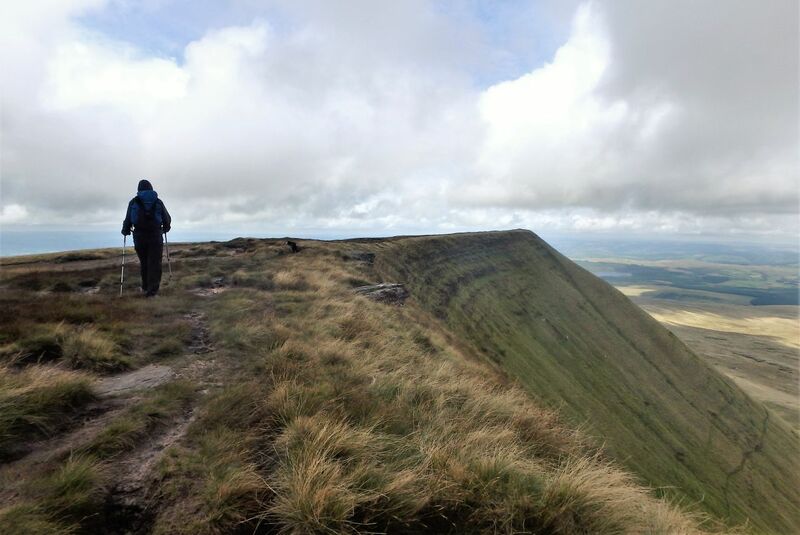 Starting up Fan Brycheiniog …. 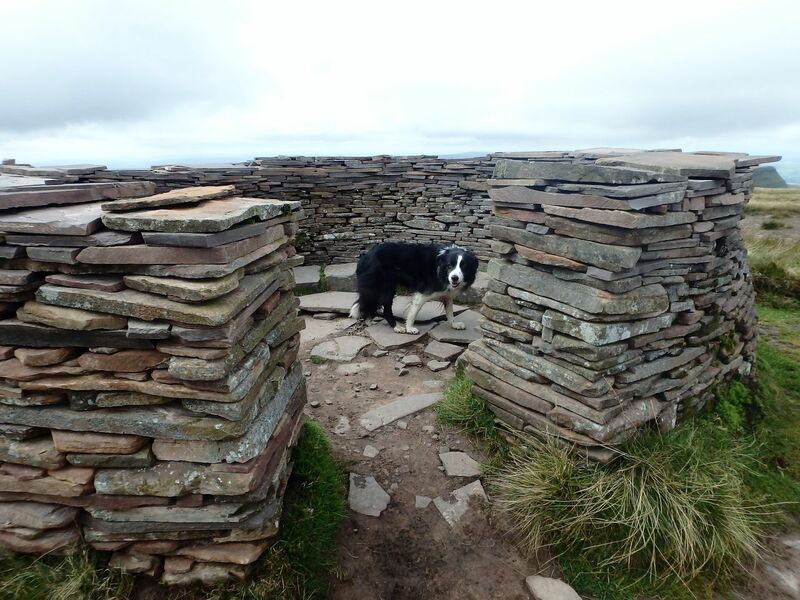 The summit shelter and trig point of Fan Brycheiniog …. …. with ‘Mist’ checking for any abandoned sandwiches! 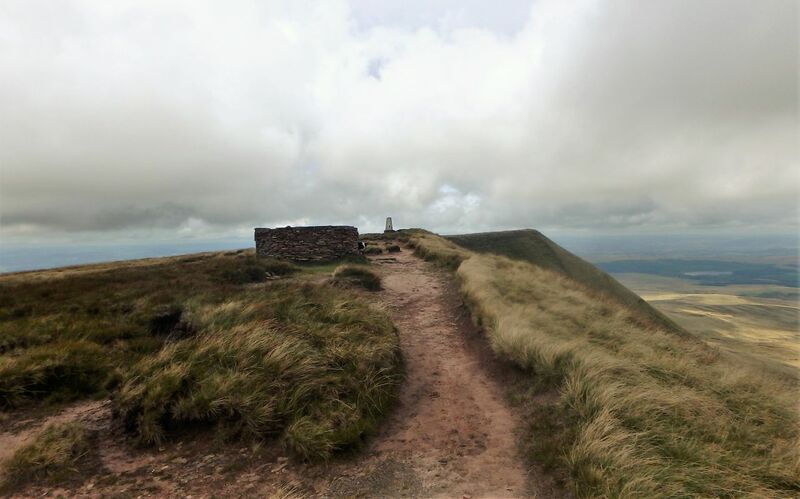 From the Col, it was the intention to carry on to the summit of Fan Brycheiniog to the north, and then to follow the top of the escarpment of Bannau Sir Gaer to drop down to the slightly smaller lake of Llyn y Fan Fach. 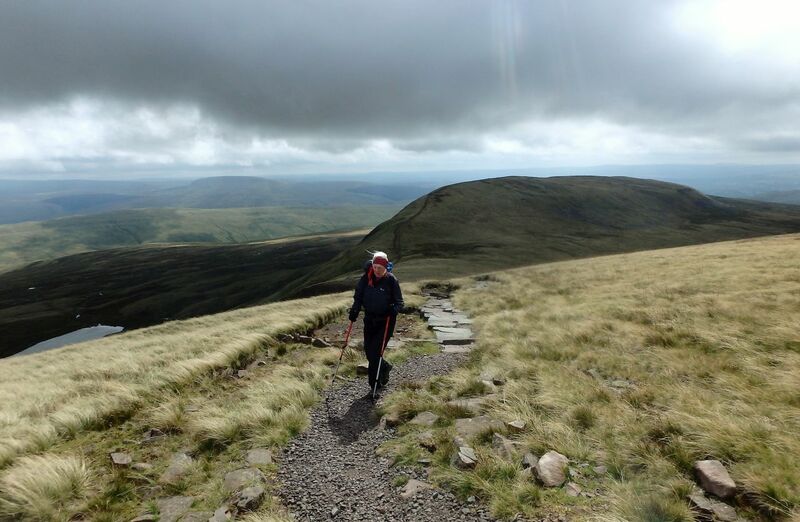 As we reached the col, however, we found out just how much shelter from the cold wind that the ridge of Fan Hir had given us on the approach, and after a short time in the cold wind Chris asked could we ‘bail out’ of the big walk. 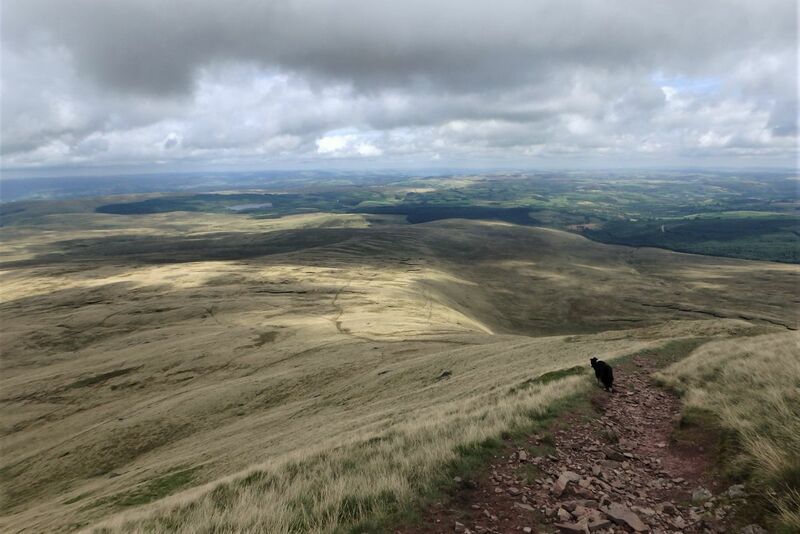 On the way down …. I had been ready to ‘tough it out’ in the chill wind, but Chris tells me that she doesn’t do ‘tough it out’ any more. 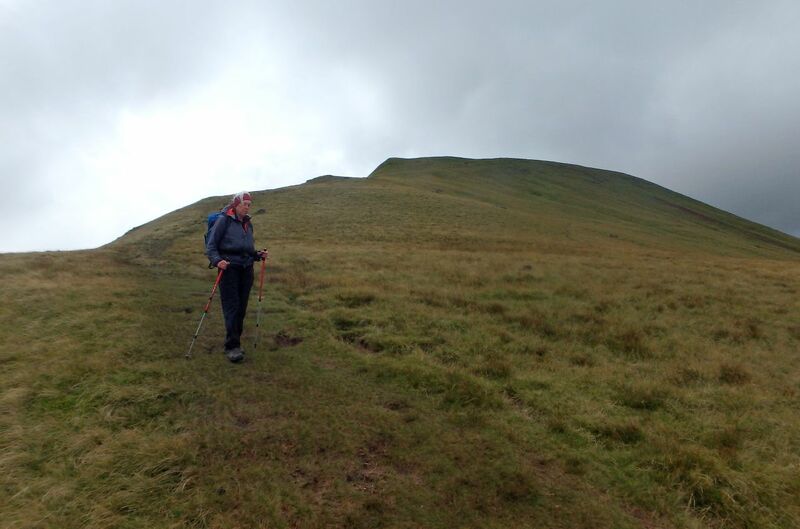 Well, you’ve got to keep the customers happy, and we knew from the last visit that there was an easy descent off the northern side of Fan Foel. 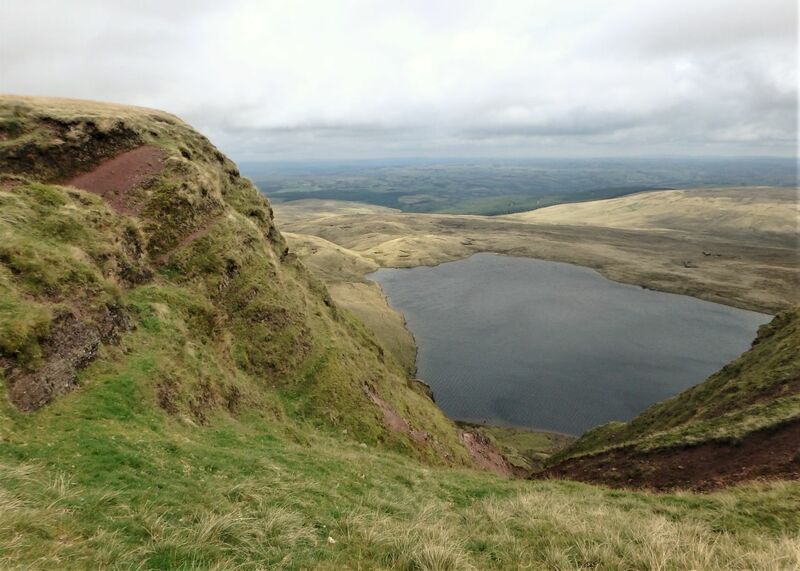 So, that became the new plan, with a return via Llyn y Fan Fawr. 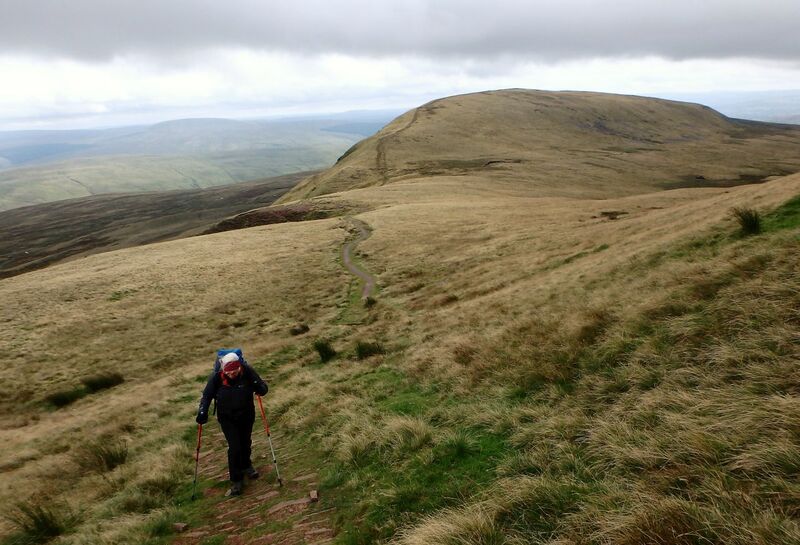 On the return to Llyn y Fan Fawr …. 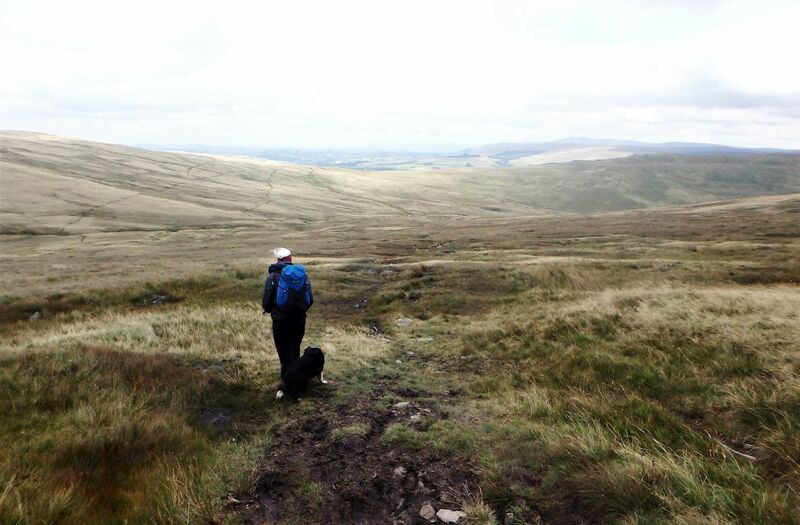 As soon as we dropped off the high plateau, we came into shelter from the wind again. 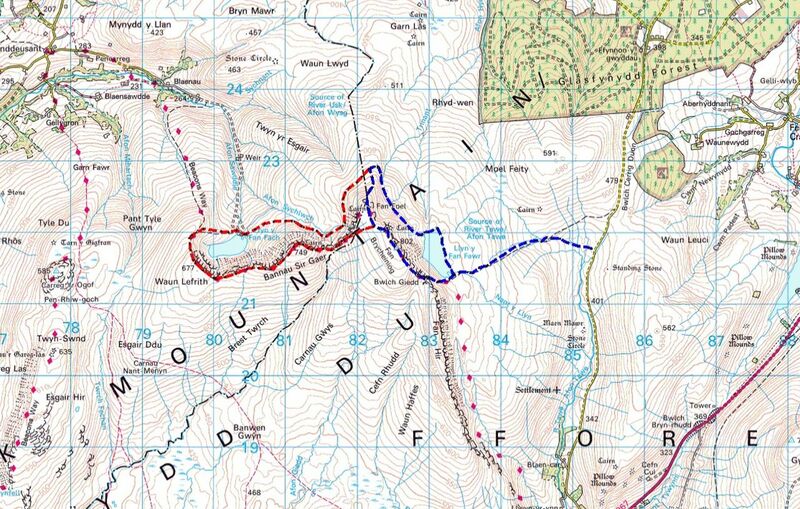 Rather than just turning around and heading back, I suggested a low-level ‘recce’ to take a look at the original objective of Llyn y Fan Fach. 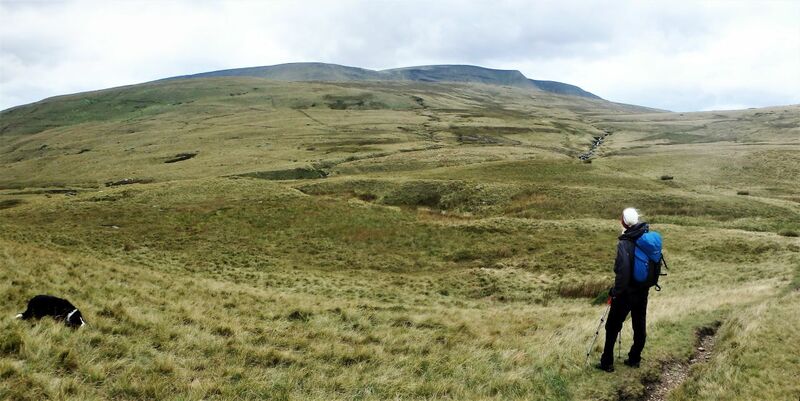 They say that time spent in reconnaissance is never wasted – well it certainly wasn’t on this occasion, and I was able to compare the original route on the ground with the route on the map. It will still be there on our next visit – perhaps we should go in May! 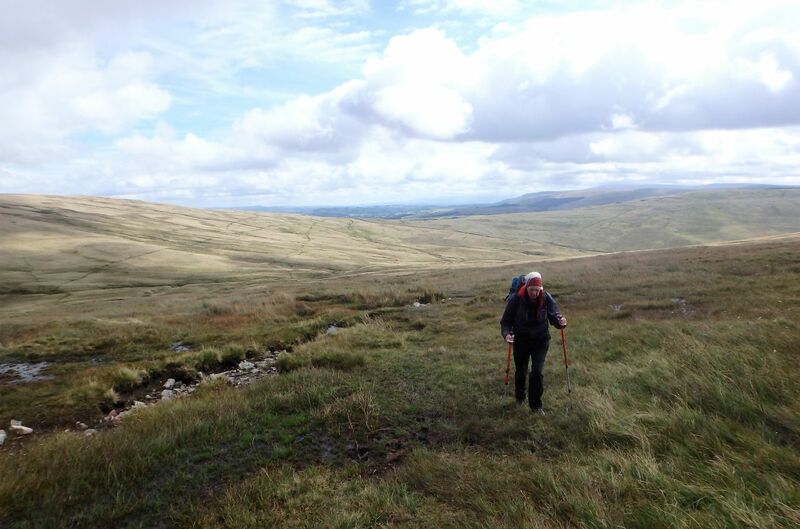 The bog was just as damp on the return leg. We were stopping over in the camper van and had a great view of where we had been wandering. As I settled down to the customary can of cider from the fridge, I wondered if it was ‘extra strong’ – the sheep we could see being driven up the hill were green! I’ve no idea what they put in the water round here, perhaps it’s better to stick to the cider. 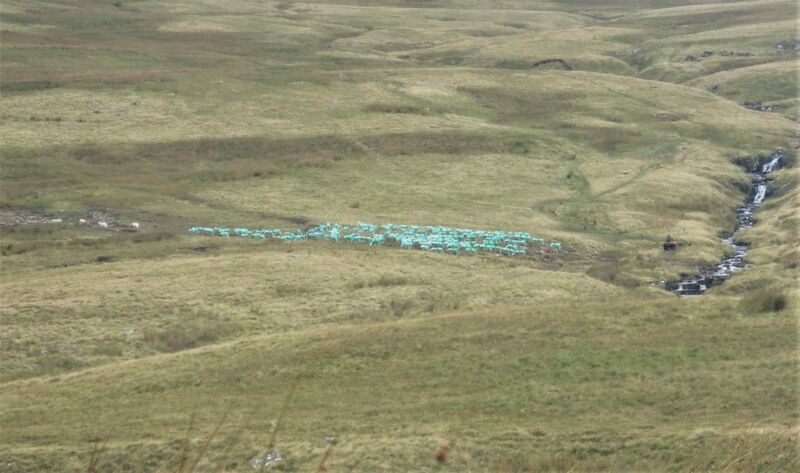 The view from the van – Green sheep!